preferably starting at a young age. "To bring this traditional subject to life, we turned to traditional methods," designer Susan Scott explains. "The illustration process began with drawings that were later transferred onto lino blocks. The images were then carved out of the blocks and printed onto textured paper. Finally, the prints were filled in by hand with coloured pencils." you might be tempted to defy gravity and try freestyle aerial skiing. Aerial ramps as high as four metres allow for jumps at angles of up to 70 degrees, dropping from a height of 9 to 12 metres. There are four players on a team: the Lead, the Second, and the Third (Vice Skip). The Fourth (Skip), is the captain, who directs the game and calls the shots. Curling is played on a constantly groomed ice surface, and the object of the game is to accumulate points by finishing with your stone or stones closer to the button (or centre) than your opponents. These stamps are from 2002 for the Winter Olympics in Salt Lake City. Not sure why they don't have the Olympic logo, but they do show the official team uniforms. Personally, the fun colours of the children's clothing is more to my taste and I wish we saw more of it in winter. Those colours were "inspired by Christmas decorations and conventional greeting cards"
From 2002 to 2008 domestic rate went up .04, I believe that is less than the rate of inflation during that time period. ahh, the good old days! six years after 2008, the domestic rate would be .85 - up .33! I love the 2008 ones (I only have the toboggan) and interesting to learn about the meticulous process that went into making them. I'll pass on the aerial skiing alough it's fun to watch. 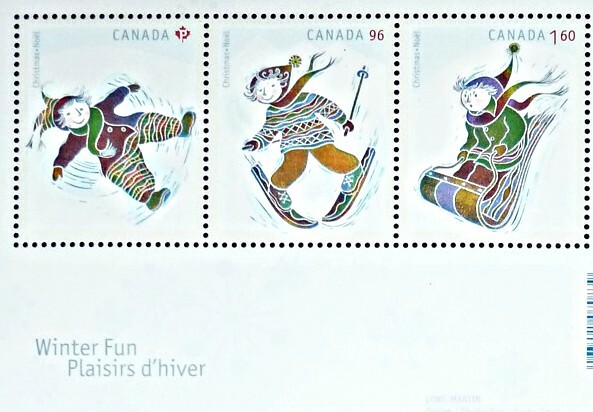 those 2008 stamps are a favourite of mine as well - and quite possibly the least Christmassy of the Christmas stamps I've seen. The Scots invented curling in medieval times but it's good to see how the sport has spread. 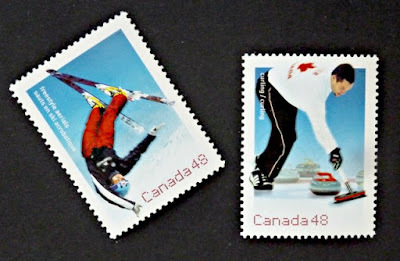 Two curling stamps is an achievement this week. That first set is cute. It's been decidedly un-winterlike here lately.